A guest’s journey has many stages involving many hotel guest touchpoints. You may think you have them all figured out, but don’t forget – your WiFi technology is all that stands between success and failure. With the right hotel WiFi network and guest services, it’s easy to remove sources of friction and provide personalized service based on gathered guest information. Check-in can be made much more seamless by adding mobility to the equation. Many hotels now offer guests the ability to check-in via an app on their mobile device. If booked through this app, a guest’s room key is waiting at the front desk upon arrival. In fact, with some mobile check-in apps, a guest no longer needs to pick up a key from the front desk. 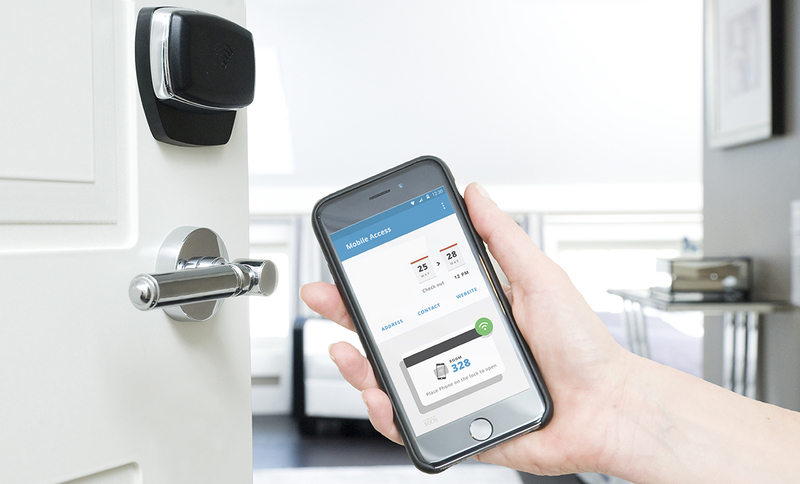 With Near Field Communication (NFC) technology or beacons, guests can gain room access via their phone. Gone are the days of waiting in line, turning over a credit card number, and signing forms. Now there’s an app for that! A modern guest room is brimming with devices waiting to be connected to the guest. Everything from environmental controls, music, minibar, phone, TV, and even the coffee maker can be controlled right from a mobile device. As a bonus, all the data regarding how guests use these devices can be captured to provide a more personalized stay. The Hotel Internet of things has arrived! Converged networking enables hotels to merge services and personalize them for different guests. Based on data from previous stays or selections made in-app, hotels can personalize a room to each guest’s preferences. Lighting and temperature can be set, favorite TV stations can be tuned in, and favored items stocked in the minibar. A guest could even choose the décor of their room. When it comes to delivering a great in-room experience, the TV has the most potential for enhancement. Poor selection of programming, resetting to a specific station when turned on and off, and lack of interactive guides make it a major pain point for guests. Streaming services such as HULU, Netflix, and YouTube are extremely popular with guests – especially millennials – and subscriptions are growing every day. Giving guests access to their BYOC (Bring Your Own Content) is the key to a great in-room entertainment experience. A new era of guest entertainment is here, room entertainment systems must be ready. LBS can be used to create and enhance the guest experience across the property. Geo-fenced driven targeting can define contextual content to send to a guest. If a guest passes near a restaurant, discounts for meals can be offered. Way-finding can be made much easier, especially for guests with a language barrier. Staff service and response can also be optimized as guest traffic flow to different areas is determined. All of this can be done right through a mobile device. All these technologies begin with a secure and robust hotel WiFi network with US based guest WiFi support. Because without a fast, reliable WiFi network, all these hotel guest touchpoints will fail. To learn more about our hotel WiFi services, support and installation, call 1-844-544-3826, or contact us to set up a site survey.